When planning a wedding there are almost always non-negotiables. The dress. The photographer. The location. The groom (hopefully). 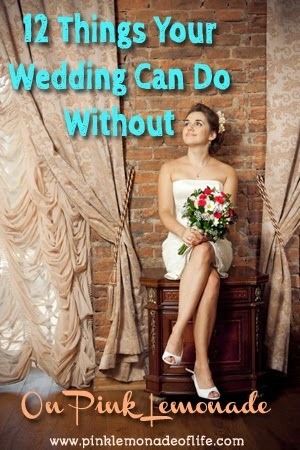 But there are plenty of things you can change, compromise or completely do without on your wedding day. Here are a few of them, and how each can help you put your money where the most important things to you are -- Maui anyone? Skip the printed postcards announcing your wedding date and use e-vites, Facebook, email and the old-fashioned phone to spread the word to out-of-town guests. If you're committed to hardcopies, check out TheWeddingChicks.com for free, elegant printables. If you're fairly well organized, you can get away without the services of a professional, so long as you have some reliable people to delegate to, like your mom and maids. Don't use this as an excuse to not do your homework and get referrals for the services you do spend your money on, like flowers and catering. For some digital help, check out this article from Mashable on the best wedding-planning apps. The more you can trim you guest list, the more money you'll save overall. Keep the invite list to the must-haves, then send out a wedding announcement (perhaps with your photo) to the masses when all is said and done. Don't even pretend you're going to find a magical dress that looks good on all the girls that they'll treasure forever. Ain't gonna happen. Choose a theme or color and allow the girls to find their own dresses that fit them (and their wallet). Provide accessories as your gift instead. If you're still not convinced, take a look at these mismatched bridesmaid dresses on Pinterest and reconsider. For some, this is a non-negotiable, and if it is, don't feel guilty spending money on it. But, if you have a friend who's great at hair and/or makeup, enlist their services and splurge by buying new makeup and hair products that you'll have for the honeymoon and months to come (and don't forget to tip the person who ends up doing the job). Weddings aren't the formal affairs they used to be. If you're wanting a more laid-back and personality-infused wedding, allow your guys to relax and wear suits (ties, bow-ties, suspenders or not...) They'll love you for it. Brides and grooms are getting married later in their 20s, and the need for a formal or traditional wedding registry is waning. Take advantage of new services like CardAvenue, an online wedding registry that allows you to register for gift cards from national retailers -- from restaurants to home stores. No one's coming to the wedding for the Cornish game hen, folks. Let's skip the formal dinner and do something fun and themed instead - perhaps a self-serve brunch for an 11 a.m. wedding, or a dessert buffet for a 2 p.m. one. You'll save a bundle and it'll be more fun for you and your guests. If drinking at your wedding isn't that important to you, skip it. You'll be amazed at how much this will ease your wedding budget. If you do feel strongly about it, choose one drink you'll be serving, or purchase your liquor at a big-box warehouse store. When ordering the cake for your wedding, don't mention that it's for a wedding. It will automatically double the price. Order a birthday cake, in whatever style you want (three-tiered, etc.). The difference is that bakers make wedding cakes with four layers and cake and three layers of filling. Birthday cakes have two layers of cake and one layer of filling. We seriously doubt your guests will notice. Unless you can pull this off for cheap and in a non-tacky way, I wouldn't sweat the wedding favors. Instead, sprinkle your tables with Hershey's Kisses, or provide little treat bags to fill at a candy station on the way out. A votive candle with your wedding date on it is not going to last long in anyone's house, except for your mother-in-law's. And even that's questionable.